I have no doubt a ton of my readers are dealing with some serious life style changes as a result of the furlough. We have so many amazing places that have stepped up I wanted to try to get them all in one place for you. As always I suggest making a phone call ahead to any location before you make a special trip. Christopher Newport University is waiving its $65 application fee for children of federal employees or contractors missing paychecks. Navy Federal Credit Union has been offering its eligible members no-interest, direct deposit loans. Of 8 million people who bank with the credit union nationwide, a little more than 100,000 have been affected by the shutdown. As of Friday, about 12,000 people had enrolled in its program, which was originally set up to cover a portion of one paycheck but will now cover two paydays. Sky Zone parks are offering federal government employees currently without pay and up to 3 immediate family members one free 60-minute jump every Tuesday – Thursday! SNAP recipients in Virginia will get their February food benefits early. Mona Lisa Restaurant & Bar on Military Highway in Norfolk is offering a free slice of pizza to Coast Guard members until they get a paycheck. Wags Doggie Day Care on 21st Street in Ghent is offering free day care for the dogs of government employees not being paid. It applies only to current Wags customers. Mike’s Mechanical in Newport News is offering up to $200 of HVAC servicing to those within 25 miles of its office. If the work costs more, federal employees can defer payment until they receive back pay. Kahiau’s Baker and Cafe in Virginia Beach free bagel or breakfast sandwich to furloughed workers who present an ID. Push Comedy Club in Norfolk is offering free shows. Destruction Room in Virginia Beach will let you smash things for free with ID. Plaza del Sol in Ghent free tacos with ID. Vintage Barbershop in Chesapeake, VA– Coast guard members get a free haircut. Virginia Stage Company– two (2) complimentary tickets to the Tony Award-winning musical Fun Home. Join us on Sunday, Jan. 27 at 2pm for Military Appreciation & Public Safety Heroes Day OR any preview night performance Wednesday, Jan. 23 – Friday, Jan. 25 at 7:30pm. To reserve tickets, visit vastage.org/hero and fill out the form. Tickets will be available at Will Call on the day of the selected performance and must be redeemed by presenting Federal Government Employee I.D. One I.D. per order. Tickets subject to availability. Virginia Beach Sheriff’s Office– will provide free meals beginning Monday, Jan. 21, with its first Dinner with a Deputy. Dinner will be served from 5 p.m. to 7 p.m. at the Law Enforcement Training Academy at 411 Integrity Way. Federal workers who have been furloughed or working without pay only need to present their federal work ID. Virginia Salvation Army– A Virginia-based Salvation Army area command announced Friday that it would cover the electric and gas bills for furloughed federal workers in Virginia Beach, Norfolk and Chesapeake. O’Connor Brewing Company– in Norfolk, VA is offering a free glass of beer to furloughed employees until the shutdown is over! Just walk right in, show your government ID and they’ll take care of the rest. Quite a few. 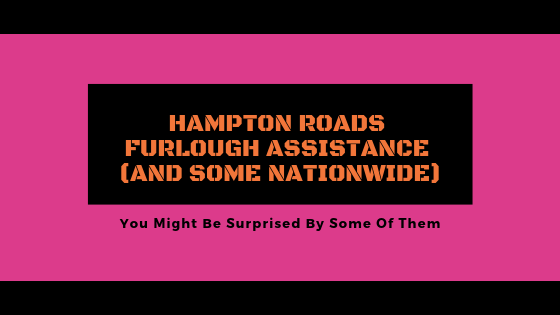 But the Southeastern Virginia Food Bank has quite a few drop off locations and might be your easiest bet. Is there a place we can take canned goods to help these families?